Cooling technologies of the Luxi. The Luxi One is a simpler version of the Luxi mattress, but the two share some of the same unique materials and construction. One Mattress, Adjusts to Soft, Medium or Firm. The Luxi Mattress incorporates the essential Support Balancing Technology (SBT) for body contouring, pressure relief and cooling. 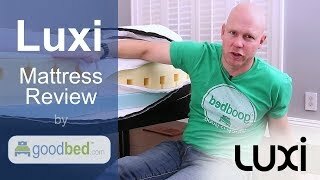 Combined with a unique design, Luxi is the first ever adjustable bed-in-a-box that offers customization and dual side adjustability for a soft, medium or firm feel - anytime. If buying a mattress online, choosing Luxi is a no brainer. Don’t fall for the one size fits all sales pitch that will keep you up at night second guessing if you made the right choice. With Luxi, you choose. Try it, if you don’t like it, change it. Open it up, Make it more firm, more soft. Less squashy. More springy. Anytime. Adjust to Perfection: Take advantage of Luxi's adjustability to achieve the perfect fit for you. The mattress can be easily changed to a soft, medium or firm feel simply by unzipping and flipping the layers. Memory Foam Quilted Cover: A top layer of memory foam to enhance plushness and luxurious feel. Support Balancing Technology: Patented foam technology to properly support your body with the right compression and body contouring. Adaptive Transition Foam: Acts as a transition layer for the perfect sink and minimizing movement. Luxitex Foam:Keeps you cool and creates a buoyant, springy feel across the mattress. Durable Base Foam: Breathable open cell structure that provides stability. 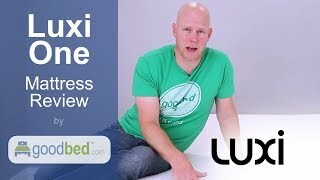 Is Luxi the right bed for you? Luxi mattresses are recommended by 48% of owners on GoodBed (based on 29 ratings + 7 reviews). Do you have something to say about your Luxi mattress? Write a Review! Comfort Layer Details: Patented foam technology to properly support your body with the right compression and body contouring. Second Layer Details: Adaptive transition foam, acts as a transition layer. Third Layer Details: Luxitex Foam, keeps you cool and creates buoyant, springy feel across the mattress. Top Layer Details: Shape-Matching Technology top layer. Patented foam technology properly supports your body with the right compression and body contouring. Mattress Thickness: 10" to 11"
Note: The product line specifications above were derived from the active Luxi models listed on GoodBed. As a result, these details may not be comprehensive and may not apply to all Luxi models. If you are seeking specifications for a particular Luxi mattress, please search for that mattress by name on GoodBed, or check with your local Luxi dealer. In Sleep, We Don't Just Dream. We Regenerate. Luxi is a mattress manufacturer founded in 2015 that is based in Chino Hills, CA in the United States. Have an update or correction to our information about Luxi? If so, please take a moment to suggest an edit. Luxi mattresses are only available online.